Anaemia and malaria are two related problems of public health significance in malaria-endemic countries, including Ghana, that continue to impact negatively on pregnancy outcomes, despite interventions being put in place to address them. The reasons for the apparent lack of efficacy of routine iron supplementation in reducing the risks of preterm and other adverse pregnancy outcomes are not clearly established in Ghana. It is not also known whether all pregnant women benefit from iron supplementation and whether there are some other factors that limit the effectiveness of prenatal iron supplementation. 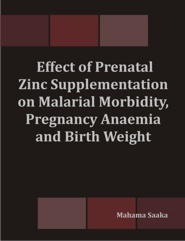 This study tested the primary hypothesis that ‘prenatal zinc supplementation in combination with malaria prophylaxis and an iron and folic acid intervention package in a zinc-deficient and malaria-endemic population will increase mean birth weight. A prospective double-blind, randomised controlled trial (RCT) was therefore conducted in Ghana from September 2005 to November 2006. The intervention group received combined 40 mg zinc as zinc gluconate and 40 mg elemental iron as ferrous sulphate supplement. The control group received 40 mg elemental iron as ferrous sulphate. Both groups received also malaria chemoprophylaxis, with sulfadoxine pyrimethamine (SP) and 400 µg folic acid. The effect of iron-zinc supplementation on mean birth weight, geometric mean plasma zinc concentrations, mean Hb change and geometric mean serum ferritin concentrations at 34-36 weeks of gestation was masked by a strong interaction between supplement type and the iron status of participants. Overall, prenatal iron-zinc supplementation resulted in no detectable difference in mean birth weight and length of gestation between iron-zinc supplemented group and the group that received standard routine antenatal services. However, among anaemic women (Hb <9.0 g/dl) and/or iron deficient women (serum ferritin <35µg/L), adjusted mean birth weight of babies born to women in the Iron-zinc Group was 131g higher than the adjusted mean birth weight of babies born to women who received the standard treatment (3223 g versus 3092 g), F (1, 121) = 4.210, p = 0.042. Joint iron and zinc supplementation together with SP was protective of malaria parasite build-up during pregnancy, compared to iron and SP (the standard malaria prophylaxis). Iron-zinc supplementation resulted in a significant difference in adjusted malaria parasite densities, F (1, 20) = 4.744, p = 0.042. Prenatal iron-zinc supplementation improved zinc status and had no adverse effect on iron status indicators. In spite of the presence of a strong inhibitory effect of high maternal iron status on iron utilisation, iron and zinc provided in the ratio of 1:1 prevented a significant depletion in maternal iron stores of pregnant women. The geometric mean serum ferritin was significantly higher in the iron-zinc, compared to the standard treatment groups (22.9 µg/L versus 16.9 µg/L), F (1, 153) = 6.336, p = 0.013. The data of this study do not support current practice that all pregnant women seeking antenatal services in Ghana be given iron supplements. The evidence further suggests combined iron and zinc supplementation is a better option than iron alone supplementation. Iron-zinc supplementation for iron deficient pregnant women deserves consideration by health policy makers in order to avoid the needless negative impact of iron and zinc deficiencies. A prospective, randomized, double blind, placebo controlled clinical trial assessing the effects of applying a force to the C5 facet joints by a mechanically assisted instrument (MAI) on referred pain to the shoulder.